God’s Way of Education Introduction. I wish to give an impression of who I am, why I really want to be a part of this God’s Way of Education and why people should trust God’s Way of Love to create such a framework to teach and engage children and families. At the moment education for our youngsters is missing something. They are not actively learning how to actually treat themselves or others lovingly, nor how to be emotionally responsible for how they feel. There are no current widely recognised lessons for this, no state or federal framework for this sort of education. I notice that Jesus & Mary always help us to see and understand the benefits of applying Principle’s of God’s Truth to our lives and I am seeing how this helps to inspire personal desire to try stuff in my own life. This blog is just to share how awesome I feel it is when I do have a go at applying Principle’s of God’s Truth to my life, or even have an intention to do so! (I am presently going through an excited patch of discovery, smile). You grow to accept yourself more, especially if you have compassion for yourself. You grow to feel happier, you have more energy, you want to explore and discover more, you find out things about yourself that were ‘forgotten’, not realized yet, or squashed that you love and enjoy doing. You feel the contrast between this state and living in fears, anger etc so it becomes a shorter time to recognise what’s going on. If I just stick to God’s Truth and Love, amazing things become possible. I got some inspiration that God made there to be an infinite amount to learn, but instead of feeling terrified about that all the time, it becomes exciting and a matter of just working through the fears and absorbing everything we possibly can and if we are blocked to doing so finding out why so we can learn more. It is a good thing our souls are made capable of such expansion & potential. You don’t have to ‘try’ all the time when you make soul based change, things feel smoother and you either do it or you don’t. Work out why you don’t want to and feel about that, then you probably will want to. Seriously, there are just so many benefits that seem to be revealing themselves and the more I experiment the more I suspect that there are only expanding, exponential benefits because so far I haven’t found any disadvantages in anything God does! This is a quality worth developing. I have led a life of inconsistency. Of being swayed every which way and all over the place. My ‘no’s’ have not meant ‘no’ my ‘yes’ has not meant ‘yes’. I have not wanted to be consistent with the kids, Pete, myself or in my life in general. I have had to use A LOT of will power to even attempt to be consistent which has taken a lot of effort to maintain for very short periods of time and then I have fallen back into inconsistency again. Recently I found out some of the reasons why I haven’t wanted to be consistent particularly with Pete and the kids, the main one being if I am consistent with them I have to be consistent with me also otherwise I am being hypocritical. Truth be told I have WANTED to let them ‘get away’ with stuff and be inconsistent because I have wanted to get away with things myself. I have wanted to have an ‘out’ or an excuse to be unethical if I want to be, or if I feel something is ‘too hard’ I have actually wanted the excuse to sin or be unloving. The problem with this is that it causes A LOT of negative consequences. It creates a lack of safety, security, certainty. It creates sin and pain emotionally which often ends up becoming chronic physical pain due to avoiding the chronic emotional pain. It also honours fear above love and truth which NEVER turns out well. I have been experimenting with consistency on and off for a while now, but the last months, I have focused on it far more than previously and I found something really awesome. When I am consistently truthful and do what Love dictates consistently, my life is enjoyable. I feel pretty good inside and I feel genuinely positive. This is new for me. But what I reckon is happening is that when I honour these things as much as I possibly can in every area that I can see, I am working more in harmony with God’s Laws and even though I have not made the full emotional changes it is improving my life. There are so many positive benefits for living in Truth, aspiring to Love and working with God’s Laws rather than against them. I aspire to do this consistently rather than periodically. God is a master of consistency, which means that I need to embrace this quality too. Consistency is a key ingredient to real happiness. In June I had a Peritonsillar abscess or throat abscess also known as a quinsy*. I have been reflecting on the experience and feel it has helped me to begin to build some faith in God. Being ill helped me to see a few of the incredible gifts of God’s creations, His perfect design in how he created the human body . The Truth that all physical illnesses are created from a refusal to feel emotional pain. The exciting bit is that if we are willing to feel emotionally I believe all disease is curable. In fact disease is a feedback system to try and get us to actually feel and work through issues at a soul level rather than a physical one. So what is a Quinsy? A peritonsillar abscess or quinsy is a bacterial infection in the throat. It generally involves a pus-filled pocket that forms on or near one of your tonsils. (Thanks to Google for this definition & wikipedia for the image on right side below). Below is an image of the abscess on the day after the pain had ceased. Unfortunately I didn’t get a picture of its development or when it was at it’s greatest size. It was really interesting, at one point pushing the dangly thing in the middle right over to the other side on a 45 degree angle, (see sketched image lower down). In my 20’s I experienced my first Quinsy. I had a tendency to refuse to emotionally or verbally express how I felt or say aloud my real thoughts and feelings. In the end the denial & emotional build up was so great that I ended up in hospital with the throat abscess being lanced – cut and drained – on an IV drip for fluids and antibiotics for four days and antibiotics and heavy painkillers. A couple of months later it reoccurred a second time and the whole process was repeated. ‘hot potato voice’ you can’t talk properly and it sounds all weird like you have a mouthful of something (you do, an abscess). it is so painful to swallow you end up drooling everywhere or spitting out your own saliva & waking up in a pool of it on the pillow. I had a container of saliva each day to dispose of. swallowing hurts. Taking in fluids or solids hurts so you avoid it if possible. This time I had a bit of an idea about what I was in for physically. But I set out to experiment with emotionally healing the issues that created it in the first place rather than just physically alleviating the pain. This involved a totally different approach and enabled me to avoid medical intervention and the side effects of prescription drugs. Motivated by physical pain, which was a result of denied and suppressed emotional pain, (refusing to feel my grief about lack of love of self** and my personal reinforcement of that) I did an experiment. The ‘experiment’ took 8 days till there was no pain at all and another five for the physical abscess to go down fully. Five or so days were just pain management and trying to get away from the pain, hoping that it would ‘get better’ and 3 or so were more sincere days which really made the difference (they kind of overlapped and I had various experiences and realisations during the other days that contributed to the more emotional ‘productive’ three days). The most important part of this experiment was making a Will based decision to feel emotionally – whatever it took – and have a sincere go at doing it God’s Way . It was the soul based decision to give it a go God’s Way that created all the positive things that followed. I experimented with things I had heard in the Divine Truth teachings*** and tested them out for myself. This was a really awesome experience and I absolutely recommend it. I now know for certain through my own experience that denial, refusing to feel how I feel & holding onto emotions makes you sick, causes illness, and releasing emotions (feeling) helps you to heal. I have added some of my observations and things learned during the illness below. Some feel quite firm in me and some I feel I need more time to allow them to fully sink into my soul****. I am really grateful to Jesus & Mary for all the information and personal experiences they share publicly about their relationship with God and feeling through emotional issues. I don’t think I would have experimented as readily without their suggestions. I did a drawing as I didn’t get a photo of the development of the quinsy. It went from nothing to at it’s peak pushing the dangly thingy int he middle to a 45 degree angle to the other side. I didn’t think to get a photo as it hurt so much to open my mouth. Wish I had ‘cos it was really interesting. The Abscess grew larger and larger until it took up more than half my throat within 24 hours (see above image). Lesson: Token chats with God, bargaining with God and hoping for ‘magic’ doesn’t make you better, it is just a way to continue to avoid the real issues and highlights the lack of desire for real change. ‘Surviving’ and ‘managing’ pain does not make it go away. Avoiding the real reason why you are ill in the first place causes you to stay sick & in pain. I tried to manage my pain in all kinds of ways which didn’t work. I came across a talk 20090801God’s Laws – Laws Governing Love of Self P1 Near the end Jesus speaks about the throat area storing grief. I allowed myself to sob. I reminded myself ‘IF you release the casual emotion the pain will no longer be there’. Lots of things I reminded myself during this experience I didn’t know to be true for certain, I just held onto the possibility that they might be true. I reminded myself of the Truth, that every time I break God’s Laws there is pain. So I must be breaking God’s Laws, I just needed to find out how I was breaking them & where. I reminded myself that God was already trying to show me, so logically there must be something in me preventing the recognition of it. I then examined my denial and resistance to knowing God’s Truth. It always comes back to me and where I am out of harmony with Love – which means I can do something about it. YAY! Lesson: God’s Truth is a relief! God’s Truth is always loving. God’s Truth helps us heal, it is the anecdote to fear. Find the Truth emotionally and you can begin to heal anything physically. Sincerely desiring God’s Truth on any matter highlights the contrast between God’s Love and our own error. The more I prayed the more I felt about how my unloving choices are making me sick – literally – and how they affect & harm others negatively. Harming myself does not just harm me. It harms my WHOLE soul and it harms others around me, either by educating them that they can treat me badly and get away with it which harms me and them, or by reinforcing people treating others badly. I had a few more good sobs – real sobbing I found is different to pain management crying. It can make pain go away very rapidly. I also experienced skipping over fear and preventing emotion immediately creates more intense physical pain. Lesson: Develop a relationship with God and you can get through anything! I don’t have a solid relationship with God yet, but even a growing desire sets one in the right direction. Lesson: Prayer is Powerful. Sincere prayers are always answered. God is good and has my best interests at heart! It is amazing that crying and releasing emotion has the power and capacity to heal any physical ailment very, very quickly; God made me so superbly that I am able to heal any ailment that is within me with God’s help and goodness. God never does anything to hurt us. It is us who harms ourselves, us who harms others or others who harm us. I had a lot of exciting realisations but the pain didn’t go away. It was not until I ‘gave up’ managing and was prepared to ‘try anything’ (in harmony with Love) that things actually began to change for real. I think I surrendered. I think surrender is when you get to a point that you are willing to do it God’s way and you let God lead rather than trying to control everything yourself. You just take direction and do the next loving thing and the next loving thing and the next loving thing that is presented to you. “Every time you break God’s Laws there is pain – physical, emotional, spiritual. Find where you are breaking law and fix it by feeling it”. I began with physical things, and did everything opposite to what I wanted to do because I had decided to do EVERYTHING i could think of opposite to what the fear was telling me to do. My body loosened, my muscles relaxed a bit and my whole body felt different. The only pain left was in my throat and ear. All other pain was gone. I was so excited, what I had heard about I had finally experienced for myself and know it to be true (in regards to physical pain). The next day my throat was still swollen and sore, I kept doing the opposite to what the fear dictated. I swallowed normally, and kept on doing it even though it was painful and over an hour or so it was no longer sore. The abscess was still there but I had no physical pain. It took another five days for the abscess itself to actually go down to a more normal-ish size. The emotional experiment with a physical ailment worked! The truth is that storing emotions is painful and refusing to release fears creates more pain. I know that for certain. I feel pretty excited to know that you can recover from a quinsy, or any physical illness, as long as you are willing to feel what you feel for real and do the opposite to what fear dictates. To apply what I did for a physical illness, to my emotional pain! *** Press here for more info on God’s Truth – Divine Truth. Jesus Quote, “Clever, Clever God” From what I have observed I am starting to see what he means! **** Some of these feelings were projected, reminded to me or reinforced to me by my Guides & spirit friends as I still have attractions showing me that I don’t have a heart based knowledge of them. Some came as a ‘voice over’ from Jesus & or Mary in my head reminding me of God’s Truth. *****Many of the things listed are things I have heard from Jesus or Mary Magdalene. The difference for me about listing them here is that I experienced them for myself and this was the awesome part. Hearing something in comparison to feeling it is quite a different experience. I look forward to learning more through my own experiences. Crying is SO good for you! What does it mean to Love our children? What would love do every moment and in every interaction we have with our partner, with children, with others? How do we know what love would do? Have you heard of ‘The Golden Rule’? A Biblical term referred to by Jesus as, ‘treating others as you would like to be treated’. Notice it is not ‘how you are treated, or how you treat others’ but rather how you would ‘like’ to be treated. Or you could take it one step further and say ‘treat others as God treats me’. This is what I understand ethics (very basically) to be. The beauty of ethics is that it is easy and simple to see based on the above premiss: treat others as you would like to be treated, and in most situations this will give a good indication if you are engaging in a loving manner or not. For me it is a process of discovery about how God treats me. I am needing to unravel a lot of false beliefs about God and have so far only heard the Truths about God not fully experienced them for myself. So I am beginning with ethics, treating others as I would like to be treated. You can do this with or without God. What does it mean to parent ethically? I feel we have a heap of double standards as adults especially with children. If we asked of ourselves what we ask or demand of our kids I can guarantee we would be outraged. We would feel controlled, belittled, interrupted, confined, isolated, shamed, unimportant, ignored, entitled, and probably a heap of other things not mentioned here that you probably felt yourself as a child. I notice often that I treat kids differently to adults. Grownups when I was a kid said things they didn’t mean, they lied and hid behind ‘nice’ facades which are not really that nice, sometimes downright terrifying. They said one thing and meant another, they didn’t explain, were dishonest and said they knew or would do things when they didn’t, wouldn’t or forgot, they made promises they couldn’t keep. Kids got in the way, were not as important as adults, didn’t get the same attention. They didn’t know what love was because they had been mis-informed and mis-educated about it also. Sometimes I wonder why people have kids if they don’t want to love them, but it seems there are many parents having kids for other reasons than love. I realise what I say could be very confrontational. I feel it is true though. I have been looking at my own reasons for having children, they were not pure and to love the children unconditionally. I am having to learn how to love and grow a sincere desire to want to love. I have had a screwed up version of love and a screwed up perception of parenting and I am going through a process of re-education. It feels uncomfortable often and I am coming to terms with the fact that I have not wanted to love. Rather I have wanted to be loved, to be cared for, to be seen as a ‘good mum’. I have wanted the children to demonstrate ‘good’ things about me because I have felt so bad inside of myself. I feel sad about this because it means I have not allowed the children to just be themselves and love them for it. I have demands, expectations and investments in them. I want from them, rather than to give to them. I have manipulated, moulded and groomed them into what I want them to be, to fit my mould, rather than what God created them to be as they are. At first I didn’t want to see what I had done. I was in a lot of denial (still am on certain issues and subjects). There are many ways to justify, minimise, deny what we have created and what we do as parents, but honestly we need to get real, get honest and see where we are unethical, where we are out of line in the treatment, especially of children, but also our partners and our brothers and sisters (other people) in general. Many people think it is okay to shame, condescend to, belittle, hit, hurt, abuse, rage at, violently treat children to varying degrees or under certain circumstances. We say it is ‘for their own good’, ‘we have their best intentions in mind’, often we even say it is because we ‘love’ them. We blame children and excuse ourselves for all sorts of hurtful actions, not seeing that it is us who our children are reflecting in the first place and we are punishing them because we don’t want to be reminded and feel our own pains and hurt parts. It is us who children mirror and they highlight our lack of love. Children learn so amazingly. They lean quickly and they learn from feelings not words. They reflect our true feelings not the ones we want everyone, including ourselves to believe are true about us (our facades – what we want to believe we are rather than what we actually are at this point in time). We are responsible, we create so much of the pain in our children’s lives*** – especially when they are very young (as they get older they act out upon the injuries created by us and use their will either in harmony with love or out of it – often dependent on what we taught them until they learn or discover otherwise. Even so their actions come from things that we did to them in the first place, because we chose not to forgive our parents for their actions. ), we create it by not allowing our own pain to flow and be released. We create it by suppressing our children, by teaching them to be what we want them to be, rather than be who they are as God created them. We teach our children that they are not okay as they are, they need to be something else – something we approve of, and they do that, or they rebel which ever will cause us to feel the most, and often instead of being humble and feeling our feelings we suppress and punish the child some more. What we need to do is to feel. To own how we feel as we feel it and to feel it responsibly, without taking it out on another soul. It is that simple. Feel and heal – without involving your kids, without involving others, just you and God, if you desire. That is how it is done. We teach children that parental approval is love. I am saying it is not. Parental approval is nothing in comparison to love, it is a substitute and a poor substitute at that, and yet even as adults we are striving for it rather than seeing that the how we would like to be treated and what we would like to feel (love) from others is mostly not what we are receiving. I feel that a massive, world wide, re-education program is needed that begins with Love – God’s version not ours. We need to re-educate ourselves with God’s Truth rather than the lies our parents and environment taught us as kids and the lies we continue to tell ourselves as grown ups, reinforcing our erroneous childhood educations, that keep us locked up as damaged children. We need to re-educate ourselves first and automatically this will educate our children about God’s Love and God’s Truth through example rather than theory. If we really want to love we can begin with ethics, we can begin with treating our children as we would ‘like’ to be treated. We can stop controlling them and begin to love them. We can stop shouting at them and withholding approval of what they do or don’t do and be soft with them, teach them about love, self discovery, self responsibility and ethical behavior themselves. We need to do this through our actions and behaviour not our words. Words are cheap and meaningless when they don’t match the real feelings coming out of us. Being honest, truthful and real is important for real relationships and friendships. To be ethical we are going to need to first be honest and see what we are doing, how we treat others and ourselves and be honest about how it actually feels. So-often we are conditioned to accept unloving behaviour and we come to feel it is ‘normal’ or ‘the only way’ or even the ‘right way’ I am suggesting there is another way (God’s Way of Love) and that we can start right now, with a first step being by simply practicing and treating others as we would like to be treated. That means stop blaming others, including your children for your own personal pain. For example, stop getting angry at children and own your feelings as yours, find out why you are angry and what you are angry about. I guarantee that you you don’t enjoy people shouting at you, punishing you, condescending to you, controlling you, having double standards and telling you lies so why are we doing it to others, especially children. Children are honest with us, until they are taught otherwise, so why are we not honest with them? I am noticing that how I was treated as a child is often how I treat children and it is only as I soften to the hurts within me that I am discovering that naturally and without effort I begin to treat our children and others more softly, acceptingly, compassionately. While I am hard and punishing with myself I am also hard and punishing with others. I encourage you to explore your own behaviours and how you treat your children, I encourage you to be real and self reflective no matter how painful it feels and find out the truth of what you feel, feel it without harming others or yourself and your life will change if you are doing this sincerely. It is beautiful and a gift to both yourself, your children and those around you. ***We harm children by mis-educating them about Love, Truth, God and not being truthful about so many subjects. Including not being truthful about our own feelings and thoughts, creating addictions with children, demanding and expecting of them, inhibiting their freewill and not correcting unloving behaviours in a loving way. Parents have a lot to answer for. I am also beginning to get glimpses though of what an incredible gift being a parent is and if we ‘parented’ more as God intended it would be friggen awesome all round – that is what I aspire to and get excited about! Children are a gift and a very fast way to learn about love, if you are willing and have a sincere desire to love, in a real way. 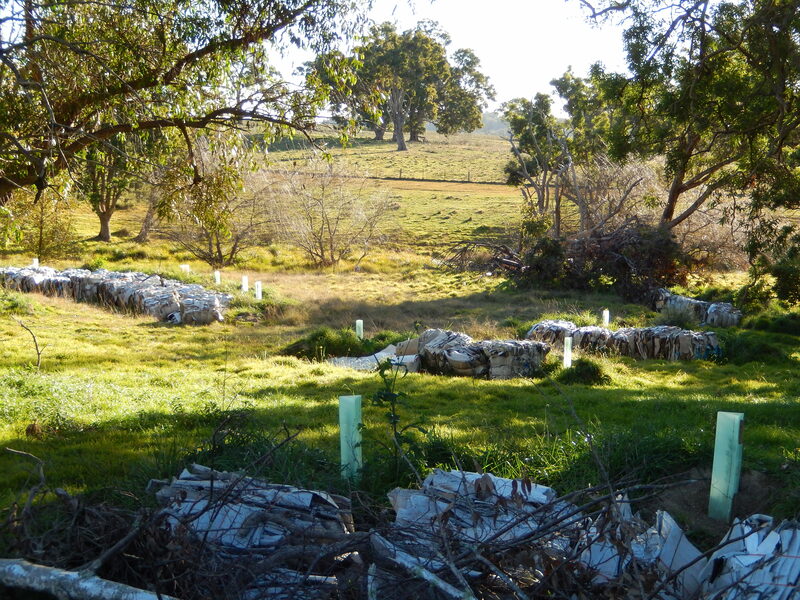 Below are images of the swales that were first dug and planted out at Octoberfest 2011. 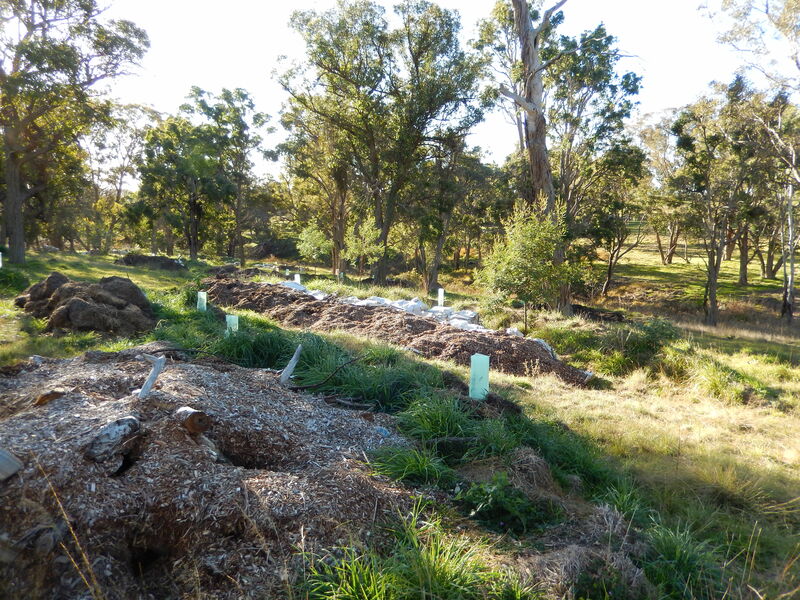 We noticed during the drought a huge difference in this area to other areas of the property. The grass was greener on the swale banks, it was longer and more lush.There is a heap of fungi growing and breaking down matter within the systems, indicating that moisture is being retained in these systems. Insect life is increasing. Animal life is increasing in this area also. Trees are growing and healthier. We have noticed that each type of matter breaks down at different rates, attracts different insects and grows different fungi and plants. Living Systems are awesome. They create abundance when made with love and given to generously when initially set up. We cannot stress enough the importance of Love and giving generously when setting up living systems. If there is no desire to love and no intention to give generously and abundantly to the project you are engaging in with the earth, the results will reflect that, our soul’s are powerful creators. 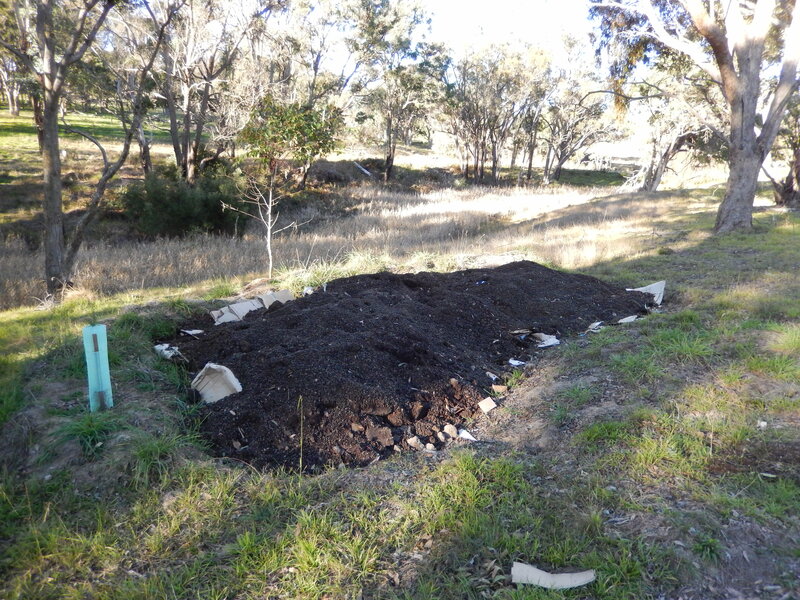 We feel that Living Systems are a really great way to begin to ‘drought proof’* a property as they hold and retain moisture under the ground and are a food source for the intelligent life that creates soil and keeps the earth healthy at the same time. 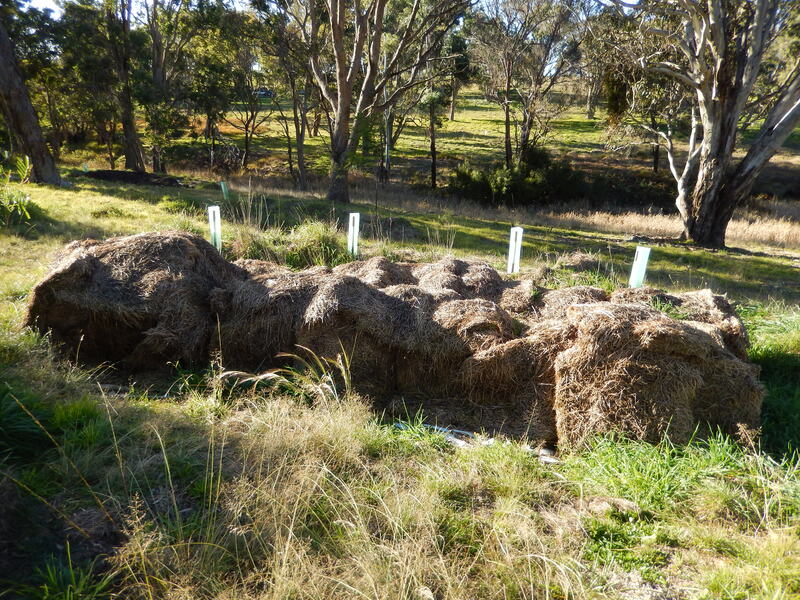 The images below hopefully give an idea of what can be achieved in your back yard as well as on a larger scale. 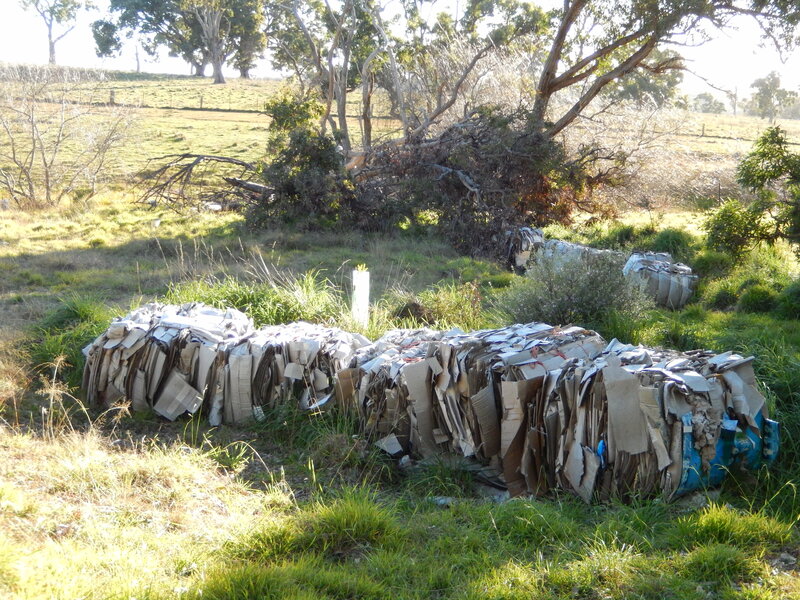 Swales being filled with Cardboard – we fill up the swales as we collect the raw materials and as our time is available. 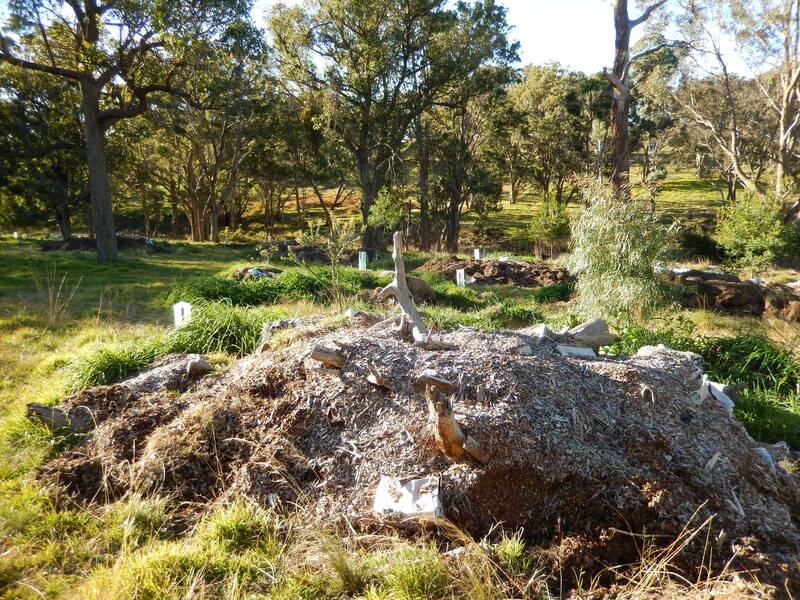 We would not recommend digging a heap of holes that you cannot fill. Leaving bare, exposed earth creates a lot of problems and potential for erosion. Make as many holes as you can fill, fill them and then create more. Do one at a time if needs be. 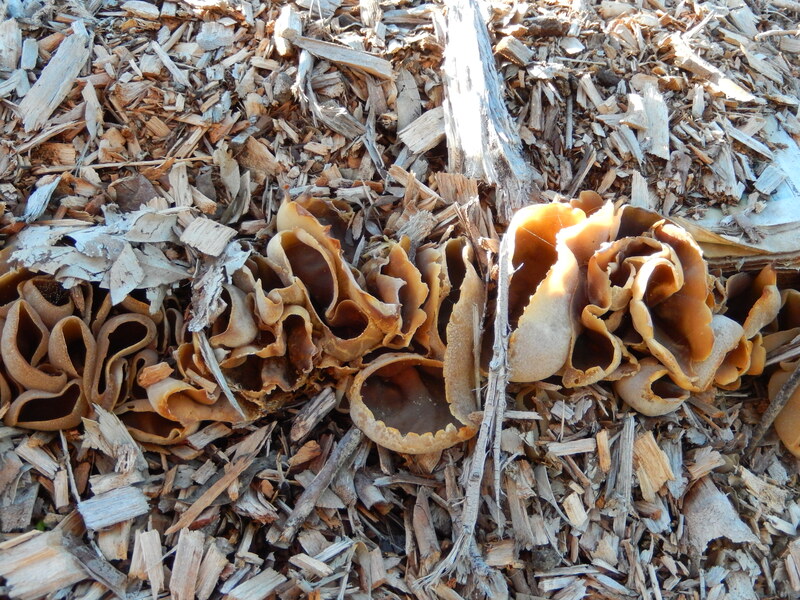 Living Systems: we noticed this awesome fungi growing in the swales that had newspaper and wood chips. The fungi is growing out from between the sheets of newspaper. Noticed this happened after the newspaper had absorbed some moisture. 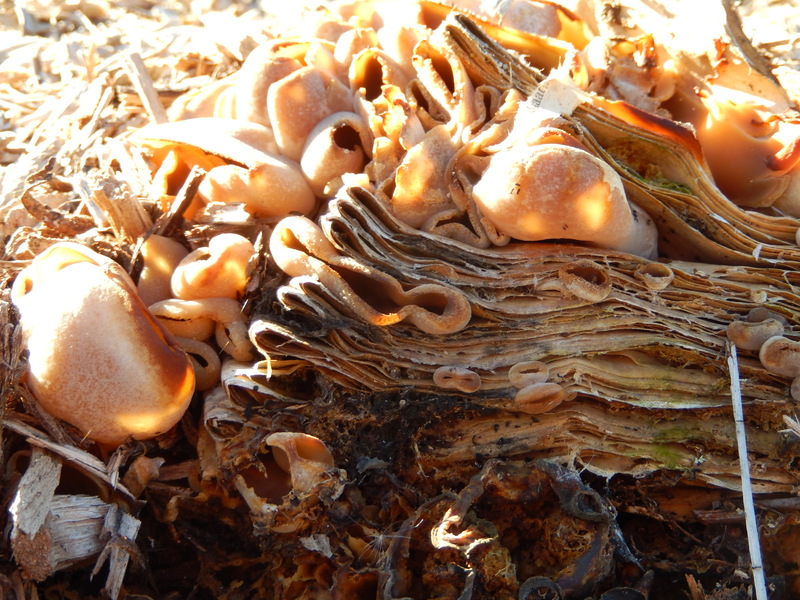 Amazing how fungi breaks down matter! !